IT’s risky business mixing very old music, especially when it’s Bach’s, with very new. It’s even riskier having the audacity to write new music settings for Martin Luther’s 500-year-old words, previously set by masters like Bach. But in a recital that told a story of rising out of the depths, finding friends, building a mighty fortress and, finally answering the call home to heaven, Australian musician, conductor and composer, Antony Pitts, and his Song Company gave the risk a pretty solid shake up. With none of the eight choristers on stage, cellist Daniel Yeadon and organist Neal Peres Da Costa very gently eased the audience’s silent anticipation into Luther’s opaque, ethereal music that seemingly had no form but had the mystery of some unknown beginning. Even the choristers entering the stage seemed to emerge in position out of the depths as if a fog had lifted. In a program of chorales and hymn settings by Australian composers, Paul Stanhope, Andrew Batt-Rawden, Ella Macens, Brett McKern, and Matthew Hindson, alongside English composers Jeremy Thurlow and Paul Ritchie, and juxtaposed to music by Luther and Bach, the Song Company gave a performance of exquisite balance, tonal quality and expression. Such was the atmosphere and marvellous music-making of this group, the hushed audience barely dared even to breathe. 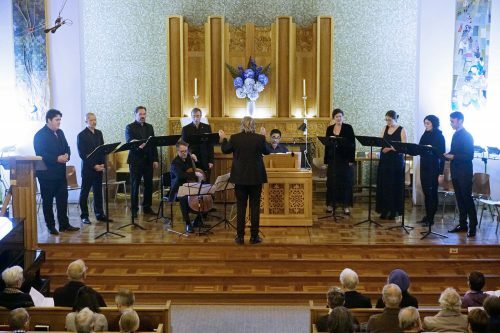 But the audience itself did get a chance to sing, in the final verse of a setting by Bach, using Luther’s harmonies, of the well-known hymn, “A Mighty Fortress”. The rhythm was slightly different to that used today, but the tune was familiar and audience sang it with gusto. For some of the works, the bass singer was placed on one end of the line of singers, taking on the important role of basso continuo, but sometimes dominating a little too much. And at times the group sang Bach’s melismas (a single syllable sung over several notes) rather too legato, losing note clarity. But these were only very tiny blemishes on an otherwise first-class performance. The group’s conductor, Antony Pitt, wrote a short work that opened the second half, played on the organ and cello. It carried quite a lot of fast chromatic fingerwork, requiring precision, clarity and a steady rhythm. But this was lost in a rather untidy performance by Da Costa. Yeadon, playing the cello, did a stirling job to make something of it. A highlight was the plainchant, “Veni Redemptor Gentium”, performed by the group’s two tenors, standing on either side of the stage. Even placed so far apart they achieved extraordinary balance and timing with a tone that floated through and filled the cavernous space of Wesley Uniting Church. It was a most moving performance. Bach had the last say, with his motet “Komm, Jesu, komm”. It was a farewell, even a good riddance, to the world, the protagonist’s work completed. But it was good riddance from neither the Song Company nor the audience. The Song Company gave a very fine recital. Four curtain calls prove it.